This Fall, Homeland Security plans to build hundreds of miles of fencing between Texas and Mexico. This fence has grave consequences for the small populations of Ocelots that still remain. Ocelots are small endangered cats whose fur resembles a jaguar.There are between 85 and 100 remaining in the Texas area, and this fence will almost certainly disrupt the breeding patterns of these cats who move to Mexico for water and to breed. 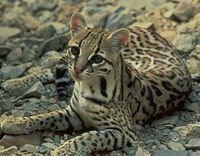 Sign this petition today to let Homeland Security know that you are watching to make sure they keep their word and protect these valuable ocelots!